BlackBerry Limited (NASDAQ:BBRY) (TSX:BB), a global leader in mobile communications, announced today that BBM™ Channels can be managed with Hootsuite, allowing social media teams to engage with their Channel followers directly from the Hootsuite dashboard. 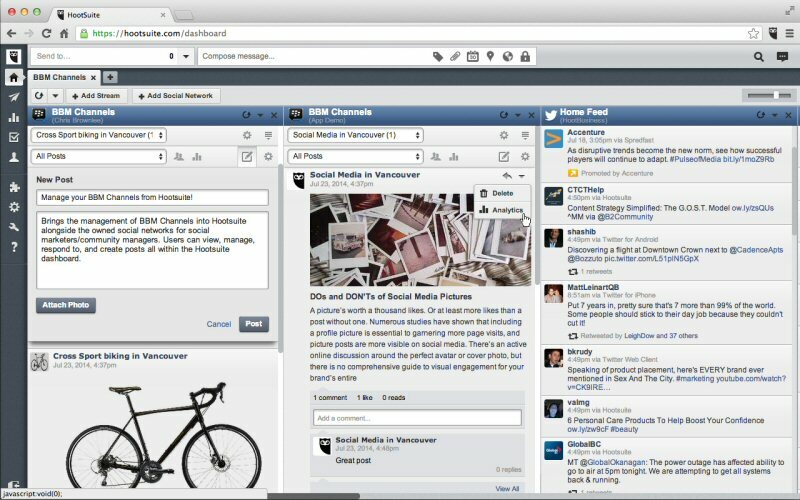 Hootsuite is the world's most widely used social relationship platform for businesses and organizations to collaboratively execute campaigns across social networks from one secure, Web-based dashboard. The integration will allow Hootsuite owners to incorporate BBM Channels into their social strategy, leveraging a mobile and highly engaged audience. All users across Hootsuite's Free, Pro and Enterprise tiers are able to manage their BBM Channels. For social media practitioners, community managers and digital marketers, Hootsuite makes it easy to incorporate content from other owned social media channels into their promotional strategies on BBM. "Managing a brand's social media presence is a juggling act. Marketers need tools that can help them automate and streamline the management of content across multiple platforms," said Matthew Talbot, Senior Vice President, Emerging Solutions at BlackBerry. "With Hootsuite, we've made it as simple as clicking a button to share posts on BBM Channels to other social media sites like Facebook, Twitter, LinkedIn and Google+ and vice-versa." The owner of a BBM Channel can engage directly with their subscribers from the Hootsuite dashboard - posting messages, sharing pictures, sparking discussions, moderating and responding to posts, and sharing and promoting other brand-related content. 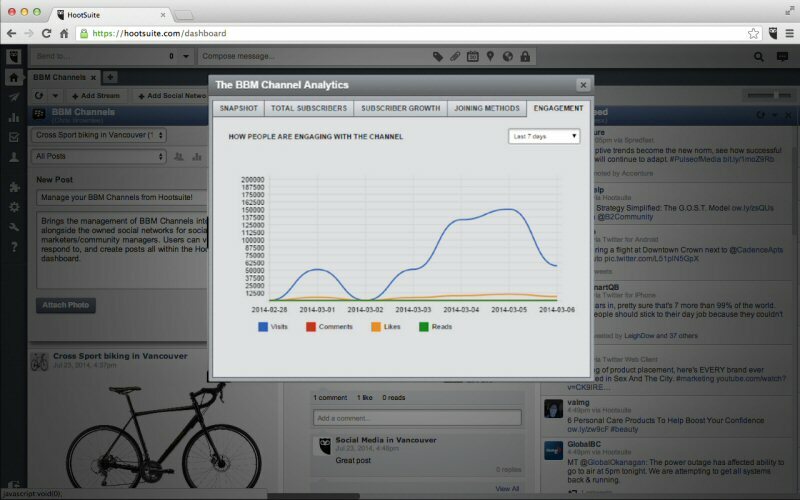 As the community interacts with the content, the dashboard provides real-time analytics to the Channel owner that measure and report users' activity. This not only saves marketers time, it helps them be more strategic with their social media engagement. "With the undeniable popularity of messaging apps, brands are looking for ways to join the conversation," said Greg Gunn, Vice President, Business Development, Hootsuite. "Our collaboration with BlackBerry on the BBM Channels App will empower users to leverage social strategies in real-time across multiple platforms, straight from the Hootsuite dashboard." "Both social media and messaging channels have been a powerful tool for FC Barcelona to engage with our large active global fan base. By bringing together Hootsuite and BBM Channels, FC Barcelona now has a way to bring their Channels content into their social media workflow to expand the reach of brand and user-generated content. The ability to be more social as an organization is integral for our success, and we expect nothing less,"
said Dídac Lee, FC Barcelona Board Member, Technology Area Director.